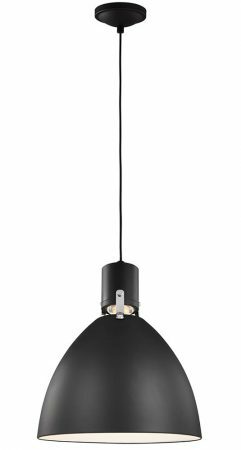 This Feiss Brynne medium LED pendant ceiling light in matte black finish is modern and features Scandinavian style. Boasting a circular ceiling mount and 36cm diameter domed steel shade in black, suspended from height adjustable cable. The shade contains 14w of integrated LED’s that produce 1000 lumens of warm white light and is supplied with polished chrome or burnished brass fitters. This Scandinavian influenced ceiling pendant blends innovative LED technology with a minimalist silhouette. Available in matte black or flat white finishes, these pendants come with two sets of mounting hardware in either polished chrome or burnished brass so you can customise the look. Height adjustable at the time of installation by shortening the supplied flex, please see below for exact dimension. Also available in matte black; please see below. This modern light is supplied by Elstead Lighting and designed in the USA by Feiss, founded in New York in 1955. They have become well known over the years for their contemporary yet classic styling, quality and great original designs such as the Brynne medium LED pendant ceiling light in matte black finish you see here.